The designation of "Western Fjords" and "Northern Fjords" is my own invention in order to keep the web pages from getting too big to load easily. The Western Fjords is the area between Bergen and Trondheim and is filled with deep, steep-sided fjords. The Northern Fjords area is Trondheim and north. 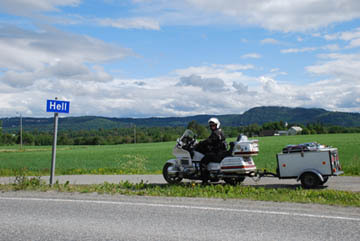 As we got closer to Trondheim (for the second time) we came up along the coast. The coast is very convoluted with bays and fjords. The road follows the coast in most places and takes quite a while to get somewhere. The land grows more rounded and hilly. The hilltops are not so high and farms are predominate with dairy, wheat and barley being the main sources of income. Trondheim is a small city but the third largest in Norway. 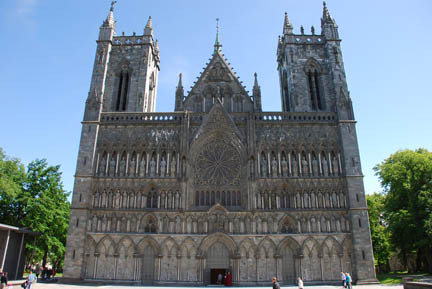 It is where King Olav started the Christian religion in Norway when he converted to it. It is also where the kings were crowned up until the early 1900's. The crown jewels are here, but no pictures were allowed, and there was a guard right there watching. 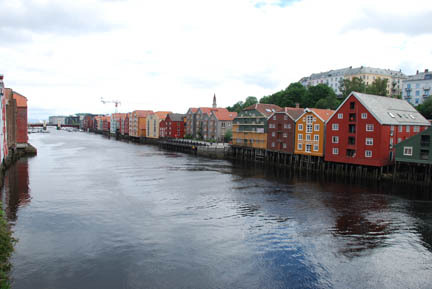 Trondheim, like most cities, towns and villages in Norway is a seaport. These are old shipping and fishing warehouses that are now upscale condos and apartments. The red, yellow and brown colors are very traditional for Norway. We saw these exact shades on houses, farms, barns, etc. all over Norway. We are about as far north as if we were halfway between Anchorage and Fairbanks in Alaska. The days are long, it does not get dark at night, just dusk. The city of Trondheim has a beautiful cathedral. The first church on this site was started by King Olav (later sainted for his starting of the Christian religion here) in the 900's. His body is buried under the spot where the altar is, again no pictures were allowed inside. The front of the cathedral has three rows of statues set in between the pillars. These are new ones from the early part of the 20th century based on pictures and the remains of the badly damaged ones from the 16th century. We took the tower tour and climbed another winding staircase up to the top, but this was the narrowest one we have ever been on. At times our shoulders rubbed on both side walls at the same time. 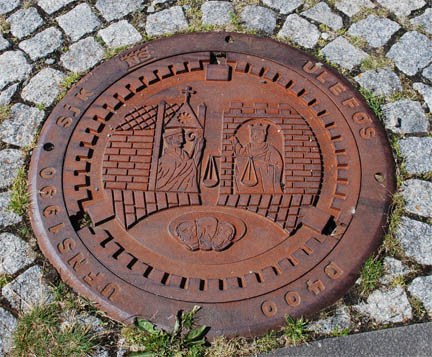 This is a manhole cover, about the same size as our American ones, but much more interesting. It shows the Bishop and King Olav on it (I think). We spent three days in Trondheim, one more than planned because we had worn out the front brake pads. I had bought a replacement set of pads on Saturday but was unable to get one of the mounting bolts loose to replace the pads. So I took it into the shop on Monday morning while Kathy packed our gear into the trailer. Then I returned to the campsite and we headed north. We have about 1800 km. 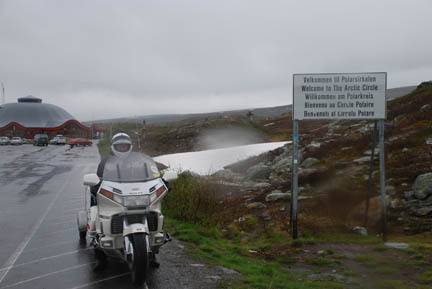 (1100 miles) to Nordkapp. On the way north we soon ended up in Hell. It is a nice small town along a small river and looked to be a very pleasant place to live. It even has a nice shopping center. 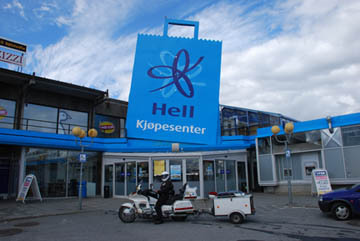 So the next time someone tells you "Go to Hell" you now know what it will be like to live there. On north we go through about 200 kilometers of rolling farm land with fields of new wheat and barley. Dairy farms are numerous and it seems every farmer is out fertilizing his fields with liquefied cow manure. The smell is at times overpowering. As we go north the weather has gotten bad and we are riding in cold and rain, no snow but temperatures are in the low forties F (about 6 or 7 C). We arrive at the Arctic Circle. Sorry about the rain drops on the camera lens. We had a quick stop, bought some souvenirs, mailed a postcard to Kathy's mom (she has no internet) and left. We have seen hundreds of signs warning of moose crossing areas. Well, we finally saw a moose, not in one of those areas, but a real, wild moose. Too bad that the camera was buried so deep in our clothing that we didn't get it out until after the moose ambled across the road and into the brush. After another ferry ride as we continue on north. The farm country is hundreds of kilometers behind. The countryside has turned into forests and the hills have gotten steeper, although not the vertical sides common down south. The weather is still rainy although we did take down camp during a break. This night it is still raining so we decide to take one of the cabins that all campgrounds have. They are small and have bunk beds. The campground office is locked and dark but a sign on the door says "set up camp and we'll contact you later. If there is a cabin available the key is hanging above." We take the only key and go across the driveway and move into the cabin. Right in front of the office. We parked the bike in front of the cabin and watched for lights to come on in the office. At 10:00 went to bed (we pulled the mattresses off the bunks and put them on the floor for a double-sized bed). The next morning we showered, packed, cleaned the cabin and the office was still dark and locked. We talked to some other campers that were leaving in their camping cars (motor homes) and they said someone had come around at six the last evening and collected from them. Somehow they missed us even though we were in plain sight of the office. So we got on the bike and left. We got a free cabin that night, about a $60.00 savings. Norway is a very expensive country to be in. This is a 175 Nkr. ($35 US dollar) lunch! 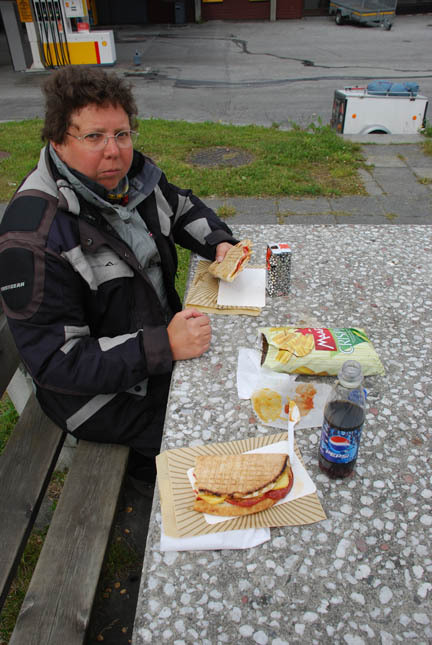 Two Panini sandwiches, two sodas and a small bag of chips! It is at a gas station where we just put the equivalent of $50 dollars in the gas tank. That used to be what I put in my truck, not the bike. Campsites cost 25 to 45 dollars, just for a place to put a tent. Ferry fees are not bad compared to back home, and the driver is included in the price of the vehicle (for an interesting story on that going to Morocco see Morocco). If the horizon was flat, and the clouds and rain gone, we would be able to see the sun 24 hours a day now. Even with the overcast sky it is light enough to read a book, inside the tent, all night. Kathy had made two sleeping masks before we left and we have been using them every night since we left Oslo. We are now in Tromsø, an even smaller city than Trondheim and a big commercial fishing port. And it has the only brewery north of the Arctic Circle. We took the tour, and a very interesting tour it was. 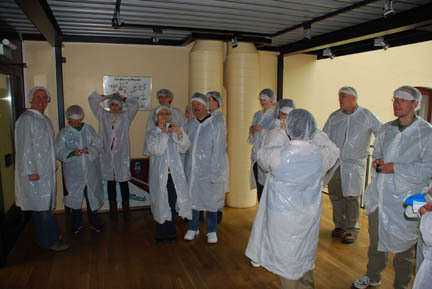 First everyone had to don these provided plastic suits and hair nets (the included plastic booties were worn later in the beer aging room room). You can see that we all thought it so funny that we took pictures of each other. Then we went into the beer bottling area, then into the Coca-Cola bottling area (they do all of it for northern Norway), then into a room with beer storage/aging tanks and then back to the pub for the "free" (included in the tour price) beer. When someone asked about the brewing area the guide said we were not allowed to go there. When pressed about it by another person he said he did not know if that was company policy or government policy. He also admitted to another person, when asked about how beer was brewed, that he didn't know how it was made. He said he had never been in the brewhouse. But at least the beer was good, and I got two more beer mugs for my collection. After that we walked through the 5 blocks of the downtown area and bought a very nice embroidered table cloth. The rain has let up but the clouds are still low, hiding the tops of the hills. 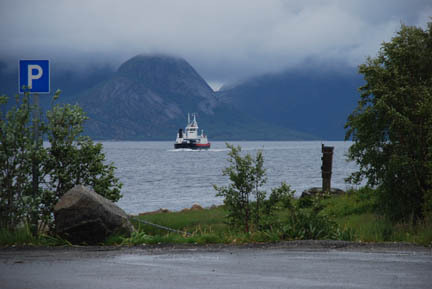 Tomorrow we leave for Nordkapp but it will take a day and a half to get there. Hope the rain holds off, at least the weather report is favorable for some partial clearing. Maybe we'll see the "Midnight Sun" yet!